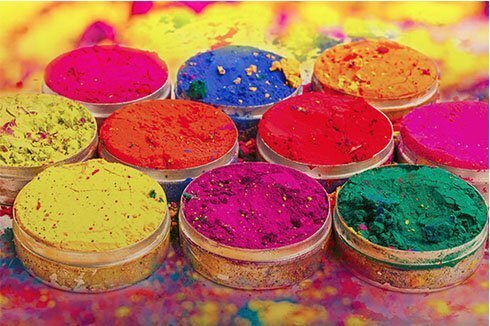 Holi is known as the festival of colors and celebrated with great enthusiasm and playfulness everywhere. It is a great equalizer as people from different walks of life come together to participate in these festivities. However, its origins lie in very different circumstances and era. According to the scriptures, the demon king Hiranyakashipu performed severe austerities in order to gain the boon of immortality. After receiving such a boon from Brahma, he considered himself invincible. Soon he ordered that everyone should only worship him; worship of the Lord was banned. Anyone, including the saints, who were found worshipping Vishnu were killed. Hiranyakashipu’s son, Prahalad was a great devotee of the Lord. Since Prahalad refused to obey his father’s orders, he was sentenced to death by his father. The soldiers tried various ways to kill him but, in each instance, he walked away unscathed. Finally, when Hiranyakashipu threatened Prahalad, the Lord came down in the avatar of Nrsingh Bhagvan to kill Hiranyakashipu and protect His young devotee. Watch Swami Mukundananda narrate these stories of Holi. Swamiji also describes a Radha Krishna Holi leela. During Dwapar Yug, young Krishna also celebrated Holi joyously. One day He asked His mother, Yashoda Maiya, “Maiya, why am I so dark and why is Radha so light complexioned?” Yashoda Maiya did not know how to answer the young child. She knew the festival of Holi was approaching, so she answered, “Holi is coming up. Now You can make Her as dark as Yourself!” Keeping His mother’s words in mind, young Krishna enthusiastically played Holi and drenched Radha and the gopis in color! To meditate on a leela of Radha Krishna celebrating Holi, watch this video by Swamiji. Why do we celebrate Ram Navami?